Studio portrait of Cathie, Jim, Hamish and Iain Askew taken in photographers in Dingwall, early 1940s. Liz, what a lovely photo. They are so recognisable(except maybe for Iain as he is so young!!). Not wanting to usurp my big sister of course but the photograph was taken in either 1943 or 1944 but more likely 1944. My late father Hamish Askew is standing in the rear of the photo and was at that time a Sergeant in the RAF having joined at age 18 in 1943. 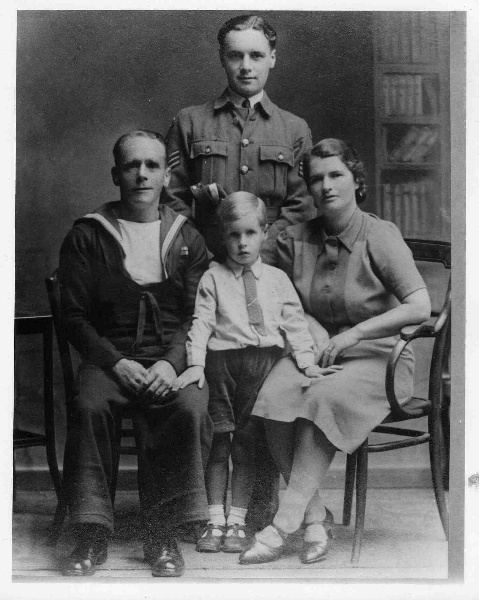 My late grandfather, James (Jim) Askew was serving through his second World War, as did many of his age group with the Royal Navy, my uncle Iain Askew is standing in the centre and my late grandmother, Catherine Askew is seated right. The family stayed at 65 Clyde Street at the time. Various RAF personnel were billeted in the house during the war such was the accommodation shortage.